This publication explains strip till purposes, equipment options, research and applications to specific crops. Greg Endres, Area Extension Specialist/Cropping, Systems, NDSU Extension Service; Jodi DeJong-Hughes, Regional Extension Educator, University of Minnesota; Dwight Aakre, retired NDSU Extension farm management specialist. In dry conditions, reduced-tillage planting systems preserve moisture in the seedbed, enhancing uniform germination and plant establishment. The trend among northern Plains farmers is toward using less tillage to produce field crops with more residue left on the soil surface. Strip till is a field tillage system that combines no till and full tillage to produce row crops. Narrow strips 6 to 12 inches wide are tilled in crop stubble, with the area between the rows left undisturbed. Often, fertilizer is injected into the tilled area during the strip-tilling operation. The tilled strips correspond to planter row widths of the next crop, and seeds are planted directly into the tilled strips. Strip tilling normally is done in the fall after harvest, but it also can be done in the spring before planting. Strip tillage can be used to qualify for the Natural Resources Conservation Service (NRCS) conservation management/no-till incentive programs. To qualify for NRCS no-till incentive programs, a Soil Tillage Intensity Rating (STIR) value of 10 or less is required. STIR is a numerical value calculated using RUSLE2, a computer model that predicts long-term average annual erosion by water. This model is based on crop management decisions implemented in a field. The NRCS assigns a numerical value to each tillage operation. STIR values range from 0 to 200, with lower scores indicating reduced soil disturbance. Other benefits of low STIR values include increased organic matter content of the soil and improved water infiltration rates. Soil organic matter plays a critical role in the global carbon cycle. Soil can act as a major source for carbon released into the atmosphere and a sink to store carbon. When carbon is stored in the soil, it is not released to the atmosphere as greenhouse gases, particularly carbon dioxide (CO2) and methane (CH4). Tillage increases microbial action on organic matter stored in the soil and normally increases the rate of decomposition that changes organic carbon into CO2. Soil organic matter is directly related to soil fertility and positively correlated with agricultural productivity potential. Besides reducing greenhouse gases, other advantages of increasing or maintaining a high level of soil organic matter include reduced soil erosion, increased resistance to compaction, increased biological activity and enhanced soil fertility. Because tillage results in soil carbon loss, identifying tillage methods that reduce the amount of carbon released into the atmosphere is important. A comparison study of soil CO2 emissions following moldboard plowing, disk ripping and strip tilling conducted in 2005 in Minnesota (Faaborg et al., 2005) determined that strip tillage maintained more soil carbon than moldboard plowing and disk ripping. 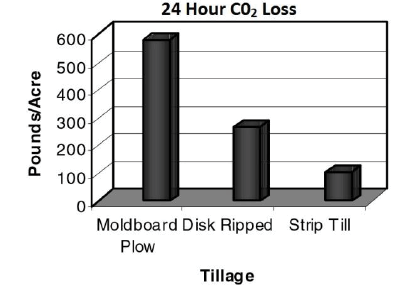 Disk ripping and strip tillage released 53.2 and 82.6 percent less CO2, respectively, than moldboard plowing (Figure 1). Moldboard plowing disturbed and exposed the greatest amount of soil, allowing carbon previously stored as organic matter or present as CO2 in the soil atmosphere to escape into the atmosphere. Figure 1. Carbon losses from tillage operations at Jeffers, Minn.
Residue from previous crops limits evaporation from the soil surface and maintains relatively high humidity levels in undisturbed soils at 90 to 100 percent, which are ideal for seed germination. Even with excellent seed-to-soil contact, approximately 85 percent of the water entering a germinating wheat seed is in the form of water vapor. In dry conditions, reduced-tillage planting systems preserve moisture in the seedbed, enhancing uniform germination and plant establishment. Crop residue also is a food source for beneficial fungi, bacteria and insects. Managed properly, the beneficial aspects of maintaining high levels of crop residue with conservation tillage systems outweigh the negative aspects. Strip till leaves most of the previous year’s crop residue on the soil surface, protecting new crop plants from wind damage during establishment and continuing to protect the soil if the crop fails to establish due to drought or flood. Crop residue readily decays and is incorporated into soil by earthworms and other invertebrates when the growing crop canopy covers the space between the rows. Several strip-tillage equipment manufacturers offer a variety of designs and features. Most equipment manufacturers market machines with similar features, including coulter blades, row cleaners, tillage shanks, berm-building disks and packing wheels or conditioning baskets. Some strip-till equipment designs include paired coulters or a large disk without a tillage shank. Most strip-till equipment manufacturers in the northern Great Plains produce strip tillers with 30-inch or 22-inch row spacing. A list of internet addresses of strip-till equipment manufacturers is included at the end of this publication. Coulter blades cut through the soil and residue ahead of the tillage shank. The coulters require mounting that allows flexible movement over stones. Some manufacturers use fluted coulters and designs with depth-control features with the coulters. The coulter size influences operation in residue; larger-diameter coulters function better in heavy residue. Parallel linkages on each row unit are desirable on strip tillers operated on soil with large stones or rolling topography because this linkage system allows row assemblies to move over stones or uneven surfaces without interrupting accurate fertilizer placement on adjacent row assemblies. Row cleaners clear residue away from the front of the tillage shank and berm-building disks, leaving a clean, tilled strip. Various manufacturers use unique proprietary designs to clear the tilled area. Row cleaners usually are mounted behind the cutting coulter and a few inches ahead of the tillage shank. Strip-till equipment needs to be designed to meter accurately and correctly place appropriate amounts of fertilizers in the tilled strips. The ability to apply one or more liquid, gaseous or dry fertilizers is an important design feature of strip-till equipment. The tillage shank penetrates and loosens soil, and normally is designed with a fertilizer injection tube to allow application of gaseous, liquid or dry granular fertilizers during the strip-tillage operation. Tillage depth is dependent on the soil type and conditions, and the specific crop to be planted. Berm-building disks are mounted on each side and 6 to 8 inches behind the tillage shank. The disks can be mounted to mound the strip to promote moisture runoff and facilitate soil drying in the spring or, alternatively, mounted to create a slight depression in the soil to catch snow and rain to increase soil moisture for the next crop. Conditioning baskets are mounted behind each shank to break soil clods and smooth the soil surface. Some manufacturers use rubber packing and row cleaner wheels instead of conditioning baskets. Large clumps likely indicate that the soil is too wet for tillage or adjustments are needed on equipment. Some system of smoothing the soil and breaking clumps is important, particularly if the strip tilling is done immediately prior to planting. Smoothing the tilled strips is less important if strip tilling is done in the fall because winter weather conditions smooth the soil naturally. All components of strip-till machines usually are mounted on three-point tool bar attachments directly to tractors or assembled as pull-type units with wheels. Pull-type designs are more common because they can be used with wider units. The power requirement of strip-till equipment varies depending on the equipment design, number of row units, components used, soil properties, shank depth, field conditions and operator adjustments. The power requirement listed in the equipment specifications by several strip-till equipment manufacturers ranges from 12 to 30 horsepower per row unit. However, because only about one-third of the field surface is tilled with strip-till equipment, the energy requirement is less than with conventional tillage systems. Accurate equipment guidance is important for strip tillage and the subsequent planting and spraying operations, particularly in irregularly shaped fields. Strip tillage machines can be equipped with markers to facilitate accurate spacing of rows on each new round in the field, or global positioning system (GPS) guidance can be used without markers. GPS positioning accuracy of greater than 6 inches pass to pass is recommended. Real-time kinematic differential correction (RTK) GPS is recommended for positioning accuracy for strip tilling. On-farm research from 2010 through 2012 in west-central Minnesota compared four full-sized tillage systems with varying crop residue levels in a corn-soybean rotation. University of Minnesota researchers included chisel plowing with spring field cultivation, disk ripping with spring field cultivation, fall strip tillage and two passes with a shallow vertical tillage implement. The type of tillage significantly affected crop residue levels in this study. Strip tillage retained the highest crop residue cover following corn and soybeans, while crop residue cover was similar for the other three tillage treatments. Corn and soybean yields were not affected by the type of tillage system (Table 1), although costs were substantially lower with strip tillage. Table 1. STIR values for common tillage operations. An earlier study in 2004 and 2005 compared on-farm corn yields at 13 sites across southern and west-central Minnesota for chisel plowing plus spring field cultivation, strip tillage, one-pass spring field cultivation and no till. Tillage treatments had a larger effect on corn yields during 2004, when air temperatures were cooler than normal, than during 2005, when air temperatures were warmer than normal. Averaged across the two years, corn yields were similar among the chisel-plowed and strip-tilled fields. These results are the same as those observed in long-term small-plot tillage trials at Waseca, Minn., where very little differences in yields have been observed among tillage systems. In a separate three-year study during 2006 to 2008 in southern Minnesota, researchers compared soybean yields among chisel plowing, strip tillage and no-till for fields previously planted in strip-tilled corn. The type of tillage had no effect on the soybean yields during the three years. This demonstrates soybean versatility among various tillage systems. Figure 2. Average soybean yield and surface residue for three tillage systems near Clarkfield, Minn., during 2010-2012. Figure 3. Average corn yield and surface residue for three tillage systems near Clarkfield, Minn., during 2010-2012. Figure 4. Average corn yields and surface residue for four tillage systems in southern Minnesota during 2004-2005. Figure 5. Average soybean yields and surface residue for four tillage systems near Jeffers, Minn., during 2004-2005. Strip-till systems remove residue from the soil surface over the seedbed, resulting in soil temperatures similar to conventional tillage systems. No-till systems leave residue on the soil surface over the seedbed, and soil temperatures often are several degrees lower than in tilled soil. Research by the University of Minnesota Extension in southern Minnesota (DeJong-Hughes, Stahl) shows an aggressive strip-till machine can clear away sufficient residue to promote soil warming similar to moldboard plowing in a continuous corn rotation (Table 2). Table 2. Soil temperatures using several different tillage operations in continuous corn. Jeffers, Minn. In a corn-soybean rotation, soil temperatures were similar for strip till and chisel plow and lower for no till (Table 3). Table 3. Soil temperatures at planting using different tillage operations in soybean/corn rotation. Jeffers, Minn. Similarly, research in the Red River Valley (Prosper, N.D., and Moorhead, Minn.) in 2007 indicated comparable temperatures between conventional tillage and strip till (Overstreet et al., 2007). The soil temperature advantage with strip till, compared with no till, is that it allows faster plant emergence and development. This advantage is enhanced when soil temperatures are lower and approach the lower threshold for crop seed germination. For example, early planted strip-till corn or soybeans likely will emerge quicker than corn planted in a no-till system. Earlier plant establishment normally increases crop yield and quality by extending the growth. Earlier emergence and stand establishment also promote quicker crop canopy closure, reducing mid- and late-season weed seed germination and providing a better chance for young plants to establish and withstand disease and insect pressure with minimal damage. Strip tillage conserves soil moisture by trapping winter snow and reducing evaporation and transpiration loss (Figures 6), resulting in more soil moisture available for plants, particularly later in the growing season during the critical plant reproductive stages. Figure 6 illustrates additional soil moisture present with strip till, compared with conventional till (Overstreet et al., 2007). Figure 6. Percent moisture in strip tilled and chisel plowed soil. In the northern Great Plains, strip tillage with fertilizer application usually is performed in the fall, followed by spring planting. Fall tillage allows time for the soil in the berm to smooth during the winter and warm as soon as the weather allows in the spring before crop planting. Strip-tillage operations can be performed in the spring in regions with coarse-textured and lower organic matter content soils. Research conducted in 2007 on loam soil at Carrington, N.D., indicates similar crop yield between fall and spring strip tillage. Research indicates strip tillage works well for crops grown with 30-inch row spacing; however, narrower row spacings also work, but residue management is more difficult with less space for residue. Mounting strip-till units on staggered bars allows residue to flow between strip-till units in narrower row spacing. Strip tillage is used with row crops, such as corn, sugar beets, soybeans, dry beans and sunflowers. The University of Minnesota Extension (J. DeJong-Hughes, J. Vetsch) compared four tillage systems for corn following soybeans on farm fields in 2004 and 2005 using producer-owned commercial tillage equipment. Corn grain yields were affected significantly by tillage treatments at six of the 10 sites in the cool growing season of 2004. Averaged across sites with the four similar tillage treatments, corn grain yields for each tillage system were: 1) no till with disk openers, 167.8 bushels per acre (bu/acre); 2) no till with hoe openers, 174.2 bu/acre; 3) strip till, 174.6 bu/acre; and 4) chisel plow plus hoe openers, 177.4 bu/acre (Figure 7). The strip-tilled fields had an average of 55 percent residue cover and the one-pass system had 30 percent residue cover. Figure 7. Corn yields with various tillage systems. In the warmer-than-normal 2005 growing season, corn yields were affected significantly by tillage treatments at only one of nine sites. Yields were: 1) no till with disk openers, 195.8 bu/acre; 2) strip till, 202.2 bu/acre; 3) no till with hoe openers, 196.5 bu/acre; and 4) chisel plow plus hoe openers, 200.5 bu/acre. 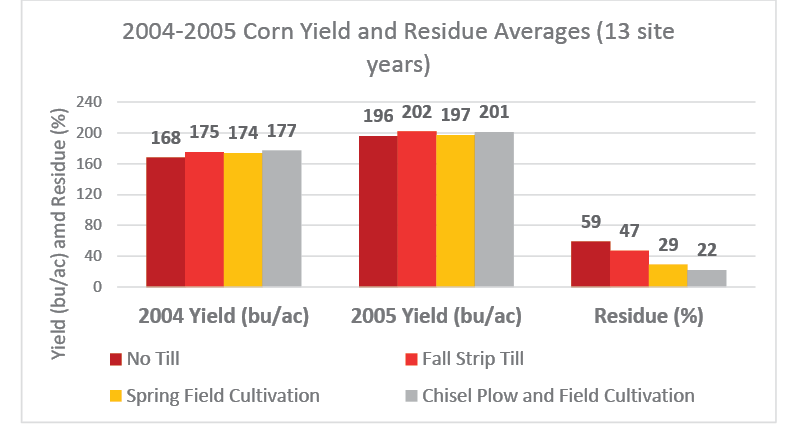 The trials in 2005 demonstrated that no till and strip till produced excellent corn yields while maintaining adequate residue cover to protect the soil from erosion. Continuous corn systems produce higher residue levels, requiring more precise management. The University of Minnesota began research in southern Minnesota in 2006 to study the effects of high-residue systems during several years. This research uses moldboard plowing, disk ripping and strip till on a continuous corn field to study the effects of residue placement on seedling emergence, soil temperature and grain yield. The soil at the site is a heavy clay loam, with poor internal drainage and no tile drainage. Residue levels varied with the aggressiveness of the tillage operation. Moldboard plowing left 10 percent residue cover, disk ripping left 34 percent and strip tilling left almost 50 percent residue on the soil surface. In 2006, the yields were similar for all three tillage systems (Table 4). In the fall of 2007, six more field trials were established using the same procedures described above. Researchers will continue to evaluate the residue buildup and its effects on yield. Table 4. Corn yields from various tillage systems in southern Minnesota. NDSU research conducted in 2007 indicated similar corn yield with strip till, compared with conventional till, and an advantage with strip-till yield, compared with no till (Endres, Franzen and Overstreet) (Table 5). At Carrington, corn was grown in 30-inch rows on a loam soil with adequate soil moisture available during the reproductive stages. Plant emergence and silking were delayed one to three days with no till, compared with strip till. Corn was grown in 22-inch rows at the Red River Valley sites. At Fargo, the trial was conducted on a silty clay loam soil. Rainfall from planting until mid-June was nearly continuous, resulting in reduced soil nitrogen (N) and corn yield. Dry edible bean production using strip till significantly reduces soil erosion potential, compared with conventional tillage. Moisture conservation is an additional benefit in arid areas. The obvious disadvantage with strip-till beans is changing harvest strategies. Strip-till edible beans require direct harvest, which potentially increases harvest loss. However, reduced harvesting equipment, time and labor, and potentially improved seed quality may offset increased harvest losses. Preliminary data in 2007 by NDSU researchers at Carrington with fall strip-till pinto beans indicate potential for seed yield increase, compared with conventionally tilled bean (Table 6). Table 6. Dry bean seed yield with tillage systems, Carrington, 2007, 2009-12. Production advantages may be gained with strip till use for soybeans in arid areas because of moisture conservation or if the crop is planted early because of warmer soils, compared with no till. NDSU research during 2005-2007 indicated similar soybean yield with strip till, compared with conventional till or no till (Endres, Franzen and Overstreet, 2007) (Table 7). The University of Minnesota Extension conducted research in southern Minnesota comparing three tillage systems for soybeans following corn on residue levels, soil temperatures and soybean yields in strip till, chisel plow and no till (J. DeJong-Hughes, L. Stahl). In 2006, the no-till fields yielded slightly less than the chisel-plowed and strip-tilled trials. In 2007, the yields were similar, reflecting the versatility of soybeans in a variety of management systems (Table 7). NDSU research with sugar beets grown in 22-inch rows was conducted during 2005-2007 at several Red River Valley locations (Franzen and Overstreet, 2007). Sugar beet yields were similar among tillage systems in two of the three years (Table 8). Strip-till yields were approximately the same as conventionally tilled plots. Table 8. Sugar beet yields with various tillage systems. Sunflower production using strip till is limited in the northern regions of the U.S. Research trials and commercial production using strip till in Kansas indicate promise for sunflowers (Olson et al., 2005). Two years of research during 2006-2007 by NDSU at Carrington (Endres et al.) have indicated similar sunflower performance for seed yield and quality among tillage systems, including strip till. Yield was not significantly different between fall and spring strip tilling (Table 9). Table 9. Sunflower seed yield with tillage systems, Carrington, 2008-11. Phosphorus and potassium can be band-applied during the strip-till operation. Banding phosphorus and potassium allows for a rate reduction of one-third, compared with broadcast application on a medium or low-testing soil (University of Minnesota Fertilizer Recommendations, 2001). Phosphorus and potassium also can be applied to crops as starter fertilizer with the planter. Nitrogen also can be applied using strip-till equipment. However, fall nitrogen application is not recommended in sandier, lighter soils or in the eastern half of Minnesota. Nitrogen can be applied as a starter fertilizer and side dressed later in the growing season. Comparing the economics of strip-till production to conventional production involves changes in production costs that can be evaluated using a partial budget. What is different and therefore needs to be included in the partial budget? Strip till should eliminate the need for whole-field primary and secondary tillage but may require a chemical burn-down operation that would not be necessary under conventional tillage. Also, adding Global Positioning System (GPS) guidance equipment may be beneficial. Costs that do not change may be ignored. These include the planting and harvesting operations, and any postharvest operations. Converting to strip-till production involves investment in different equipment that results in changes to fixed and variable costs. Fixed costs are based on initial investment. The expected use in acres for a 24-row pull-type tiller and a six-row tool bar tiller are shown in Table 10. Table 11 shows the ownership costs in detail. Table 10. 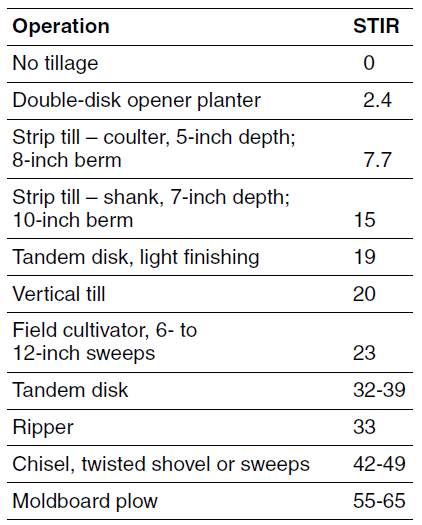 Estimated cost and use factors for strip-till equipment. Table 11. Ownership (fixed) costs of alternative strip-till equipment. The annual ownership cost of the 24-row tiller is estimated to be $5,354, or $5.35 per acre, based on an estimated annual use on 1,000 acres. The lower-investment six-row tiller would have an estimated annual ownership cost of $571, or $1.43 per acre, based on annual usage of 400 acres. The operating costs of 24-row and six-row equipment are shown in Table 12. Operating costs include fuel, lubrication, repairs and labor. The total operating cost is $3 per acre for the 24-row equipment and $4.24 per acre for the six-row equipment. Table 12. Operating (variable) costs of alternative strip-till equipment. Total costs are summarized in Table 13. The total cost per acre for the 24-row equipment, including the power unit, is estimated to be $10.42 per acre. The total cost for the six-row equipment and power unit is estimated at $7.98 per acre. The smaller equipment has higher operating costs but considerably lower fixed costs. Table 13. Total cost per acre for alternative strip-till equipment. Converting to a strip-till method of production from conventional tillage will eliminate expenses associated with primary and secondary tillage. Table 14 summarizes total and use-related cost for chisel plowing, field cultivation and ground spraying. Table 14. Cost of conventional tillage operations ($/ac). The difference between total cost and use-related cost is interest on the investment and part of the depreciation. If the chisel plow and field cultivator are not sold, the appropriate reduction in cost to apply is the use-related cost of $5.18 per acre for chisel plowing and $2.97 per acre for field cultivating. A partial budget summary is shown in Table 15. Additional costs for strip tillage include machinery ownership and operation costs, chemical burn-down and a ground-spraying operation. Reduced costs include eliminating chisel plowing and field cultivation. The estimated change in per-acre costs would be an increase of $12.03 per acre for the 24-row equipment and an increase of $9.59 per acre for the six-row equipment. Table 15. Strip till vs. conventional till: a partial budget. • Match the strip-till row width with the planter row width. • Leave corn stubble standing for maximum air movement and less matting of residue. Build strips between the previous crop rows. • For the greatest soil warmup and seed-to-soil contact, strip tillage should be performed in the fall. • In cooler, fine-textured soils, strip-till equipment should clear the berm to less than 10 percent residue for faster soil warming in the spring. • In high-moisture conditions, build berms approximately 3 inches high in the fall so they are at least 1 inch high by planting. In arid conditions, berms can be depressed to collect winter snow. • The economic advantages of strip till are improved if banding phosphorus and potassium fertilizer with the fall strip operation. • Avoid slopes of more than 7 percent without contouring; otherwise, soil erosion can occur in tilled strips. Faaborg, R., C. Wente, J.M. De Jong-Hughes and D.C. Reicosky. 2005. A comparison of soil CO2 emissions following moldboard plowing, disk ripping and strip tilling. USDA-ARS research update. Overstreet, L.F., D. Franzen, N.R. Cattanach and S. Gegner. 2007. Strip-tillage in sugarbeet rotations. In 2007 Sugarbeet Research and Extension Reports. Vol. 38. Sugarbeet Res. And Ed. BD. of MN and ND. Olson, B., J. Falk and R. Aiken. 2007. Sunflower yield as affected by strip-till. National Sunflower Association 2007 Research Forum. University of Minnesota Extension “Machinery Cost Estimates.” September 2007. Endres, G., and B. Schatz. 2007 Carrington Research Extension Center Annual Report. DeJong-Hughes, J., and J. Vetsch. (2007) On-farm comparison of conservation tillage systems for corn following soybeans. University of Minnesota Extension Publication BU-08483.